Rate Extra Weeks in ZAR: R 4000 per week when extending for longer than one month. Duration: The minimum time period for a booking is a 2 weeks placement and maximum time period is 12 weeks. Please note that our activities are based on a minimum stay of 4 weeks. Although many of the activities listed below may take place in 2-3 week placements, not all are guaranteed. So the longer your stay, the more in depth your experience. Dates: There are no set arrival/departure dates for this project, but please note no arrivals or departures over weekends (Saturdays and Sundays). Arrivals and departures are preferred to be scheduled for a Monday. Volunteers are required to sign an indemnity form acknowledging and accepting the consequences of working in close contact with wild animals. Introduction: Interested in doing conservation work on a Big 5 Game Reserve? Location: The reserve is one of the oldest and most established game reserve in the beautiful Eastern Cape of South Africa. About 2 hours drive from Port Elizabeth. Getting to Project: You will be collected from arrivals at Port Elizabeth airport. The taxi company should have a sign with your name on it. If they are a little bit late, please just stay put at arrivals. Should your connecting flight from Johannesburg or Cape Town be delayed, please call us so that the taxi company can be informed about your delay. You will need to pay the driver of your taxi directly for your transfer from the airport to the reserve. The current price is R700 per person for a one way transfer (R350 per person sharing a vehicle). Please make sure you have South African Rands with you to pay the driver. The same applies for your return transfer. Where at all possible, we will organize for volunteers arriving/departing on the same day to share a taxi and therefore reduce the per person transfer fee. Population status and the role of The Game Reserve as a key habitat refuge. 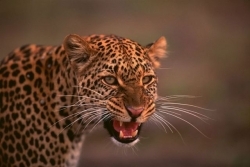 * How many leopards occur on The Game Reserve and in the Lower Albany area? This will be addressed by collecting data on sightings, camera trap records and possibly genetic analysis. * Is leopard activity in the Lower Albany area focused on conservation areas such as The Game Reserve? * Is there evidence for an increase in leopard numbers and wider distribution within the Lower Albany Area? This will be addressed by relating the above-mentioned information to historical records of leopards in the study area. Volunteers will help monitor elephant movement patterns, range utilization and vegetation impact with the aid of telemetry (certain individuals are fitted with radio collars). A part of this research project that volunteers are very involved with, is recording the unique ear markings of each elephant for management purposes. Elephant identification sheets are given to each volunteer, who in turn will assist the conservation department in this regard. One of the volunteer programme�s responsibilities is to record as many lion kills as possible. This data provides the conservation department with valuable information regarding prey selection. Certain lions on the reserve are fitted with radio collars, so volunteers will learn how to use telemetry tracking. This project involves preparing a catalogue of the birds, bird numbers and their breeding status in the reserve as part of a project headed by the University of Cape Town�s Avian Demography Unit. Movement patterns and breeding rates of these interesting predators are monitored. None of the hyenas are fitted with radio collars, so it can be quite a challenge finding them on the reserve. Our recent volunteers found a den site � one of our females gave birth! Conservation management activities form a large part of the volunteer programme. Some of these activities involve physical work and therefore a certain level of determination from the volunteer�s side is required. Keep in mind that the "reserve needs" are always taken into account and you will help to fulfil those needs as a volunteer. Volunteers will assist in the eradication and control of alien (non-endemic) plant species. Bush encroachment control through selective clearing is also done in certain areas on the reserve. This aspect involves physical hard work! Previous land utilization practices like cattle ranching has caused erosion gulleys in certain areas on the reserve. These sites need to be rehabilitated. Volunteers assist in pulling out remaining old cattle fences and water pipes on the reserve. Our recent volunteers had the AMAZING once-in-a-lifetime opportunity to assist with the capture of the following species on the reserve: elephant, lion, rhino, hyena, giraffe, wildebeest, zebra and impala!! Please remember that captures only occur when required by the reserve and not for the sake of the volunteers. There is an ongoing programme for the introduction of additional game, especially as the reserve has just acquired more land that will need to be stocked with various different African mammal species. An important driving force in savanna ecosystems (depending on the time of year and fire regimes)Education / Theory Each volunteer will be given a field booklet, which can be taken home at the end of the placement. Before you start with each practical task, the relative theoretical background on the subject will be discussed in the form of informal lectures. The theory provides insight into the value of the practical activities in which you may participate. Mammal, plant and bird checklists are included in the booklet and will help you to identify different species. Learn to look after yourself in the wild Community development We have identified an under-funded farm school near the reserve where our volunteer programme can make a real difference. The school is small, yet very under-staffed and local kids aged 4 to 15 years attend the school. Volunteers visit the school one day a week (not during school holidays or rainy days (most of the children walk about 10 km to attend school so if it rains, no one goes to school! ), and make valuable contributions to the children�s education. Our volunteers take many of the classes themselves and teach 6-12 year olds subjects like English, Maths and Science. You might also help with the maintenance of the school�s facilities or by giving sport lessons to the kids. A recent group of volunteers renovated a classroom (with a completely collapsed ceiling and floorboards!) for the pre-primary school kids. Your contribution here is real, and both the children and the headmistress are very appreciative. Guaranteed to leave you with a feeling of satisfaction. Animals: This Game Reserve is a Big 5 reserve that is abundantly stocked with numerious species of African mammals. We guarantee excellent game viewing! Accommodation: Volunteers are accommodated in a renovated, fully furnished house on the reserve - comfortable but not luxurious. You will be sharing bedrooms (bedding provided for you) and there are communal bathrooms (2 bathrooms in the house). There is an entertainment / lecture room, a lounge with a T.V (South African channels), dining room and a fully equip kitchen with a fridge, stove, microwave, cutlery, crockery and cooking utensils. There is a safe for cash and small valuables on site. Please bear in mind that the house is in the middle of a "Big 5" game reserve, so therefore one cannot walk outside the boundaries of the garden fence. A plunge pool is situated in the garden for volunteers to cool off in after a hard day�s work. There is also a �braai� (BBQ) area outside in the garden. Upgrade Dbl/Twin: If volunteers book well in advance, couples can request to share a double room. Includes: Prices include accommodation for the duration of your placement, all work activities on the reserve and three meals per day. Excludes: Airport transfers to and from Port Elizabeth airport are not included. This is payable directly to the taxi driver . Also not included are entertainment expenses over weekends and socializing costs (drinks and meals volunteers choose to have while out in town. Applicants: Applicants must be between the ages of 18 and 50. No previous conservation experience is required. We take on enthusiastic volunteers who are eager to learn and prepared to work hard and play hard! Hours: Working hours on the reserve are generally speaking Monday to Friday 7.30am to 5.00pm with and hour or two for lunch (please note working hours are dependent on weather and nature of activity). Freetime: Working hours on the reserve are generally speaking Monday to Friday 7.30am to 5.00pm with and hour or two for lunch (please note working hours are dependent on weather and nature of activity). The evenings and weekends are at leisure. Saturdays are generally reserved for town trips to allow volunteers to stock up on everyday essentials and to make use of internet and phone facilities. Sundays are off time for both the volunteers and the volunteer coordinator and volunteers are to entertain themselves. Additional activities that can be organised for you on a Saturday are at own cost and on condition that a few others in the group also want to partake in the activity. Below is a list of activities and , which have proved popular with past volunteers. This will help you with your budgeting. Sky-diving (tandem) � this means you are strapped to an instructor! "I had a great stay here on Kariega Game Reserve. My absolute highlight was the capture of rhinos on the reserve. It is amazing how involved the volunteers could get and how close to the tranquilized animals we could get. I also had the privilege to meet and get to know a lot of great, interesting people whilst staying on Kariega. They definitely made my stay worth remembering forever. My recommendation to future Kariega volunteers is to put as much energy as you can into every activity. You will get so much satisfaction out of it. And remember: T.I.A - This is Africa! Thank you for this great experience!" - Damien (22), Zurich, Switzerland, 12/11/2012 - 14/12/2012 (5 weeks). This listing has been viewed 16214 times.